...you can read my church-lady lecture about complaining and the frugal life! Hey! 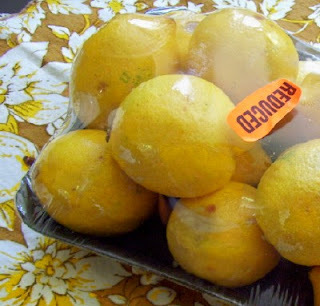 I just bought reduced-price lemons today too. $0.39/each. This is my first visit to your blog, and I am enjoying your posts. I needed to hear your comments about complaining. It's so easy to do. Loved to read your cheerful frugality post. It's something I need to remember every time I go shopping. Very timely--we bought a bunch of limes for next to nothing this week and when the kids asked "why are we having limeade" at lunch time, the old saying came up! SO enjoyed your cheerful frugality post!! Thanks! If life gave me lots of lemons, I have an *excellent* lemon pie recipe! :) And also lemony butter cookies. Mmm. The post you linked to was great!